Complete the sweepstakes form and get the prizes for you, $354.55 in Value. 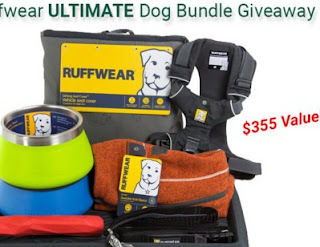 prizes: The prizes are: 1 Ruffwear DirtBag Seat Cover, 1 Fernie in Orange, 1 Front Range Harness in Gray, 1 Roamer Leash in Large/Gray, 1 Basecamp Bowl in Blue, 1 Basecamp Bowl in Green, 1 Basecamp Mat, 1 Beacon, 1 Gnawt-a-Stick in Red. Nothing else is included with this package, and no substitutions or returns are allowed. $354.55 Value. To join: visit avidmax.com/news/the-ruffwear-ultimate-dog-bundle-giveaway/ and complete the online entry form.